HOUSTON, Texas — Texas Governor Rick Perry recently penned a letter to Mexican President Peña Nieto, after Nieto responded negatively to Perry’s decision to deploy the Texas National Guard to his state’s southern border. Perry’s decision came amid the border crisis, which has involved thousands of Central Americans entering the U.S. illegally. Perry further pointed out that as Texas has continued to flourish economically, the state has had a strong commercial relationship with Mexico. This has created “opportunity for families on both sides of the border,” Perry argued. Perry correctly pointed out that cartel violence negatively impacts both sides of the U.S.-Mexico border, and that in order to put a stop to such violence the two nations must work together. He added that while many of those illegally crossing the border may be good people, others have criminal intent. The governor also asserted that Mexico is partly responsible for the border crisis. Mexico has largely failed to secure its own southern border. Because of this, thousands of children from Central America have risked their lives traveling through Mexico’s cartel-ridden cities on their journey to the United States. “Our challenges today are partly a consequence of the failure of the Mexican government to secure its southern border from illegal immigration by unaccompanied children and other individuals from Central America, or to deploy adequate resources to control the criminal element in Mexico,” the governor wrote. 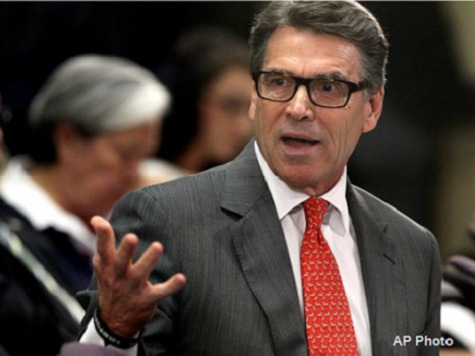 Ultimately, Perry invited Nieto to Texas in order to prompt a discussion regarding solutions to the border crisis.